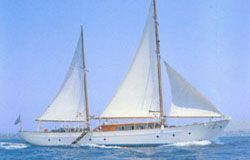 The Classic wooden crewed motorsailer M/S GOLDEN PROMISE is offered for charter in Greece and cruises at the Greek islands. 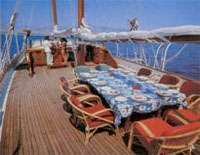 Is a spacious 76 feet yacht, superbly fitted and seaworthy motorsailer with modern facilities, inviting and airy interior living areas, spacious decks for sun bathing and relaxing while sailing or dining al fresco and her guests are treated like royalty by her efficient 4 member crew. 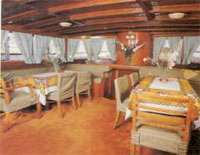 She accommodates 10 guests in 5 spacious cabins. You will never forget your "GOLDEN PROMISE" adventure! She truly delivers what she promises! Superbly fitted with every convenience in order to offer you an unforgettable cruise at the Greek islands. Enjoy life on the deck which is large enough for sun-bathing or outdoor dining. A speed boat is ready to fulfill your wishes for skiing or going ashore. L.O.A. : 23 m / 76 ft.
BEAM: 6 m / 19,2 ft. 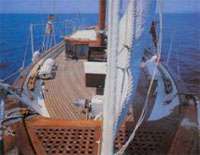 INCLUDING: All operation expenses of the yacht crews wares & food & port anchorage due in Greek waters, insurance of yacht & crew & V.A.T. EXCLUDING: Fuel consumption (90 liters per hour), canal fees & harbor fees out of Greek waters, passenger food and beverages. Comfortable arm-chairs and mattresses complete your comforts which are similar to the ones found only at the most deluxe resort hotels! 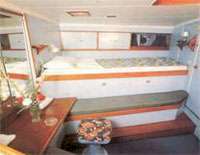 The quality of the construction is unique in every detail both for cruising and comfort.